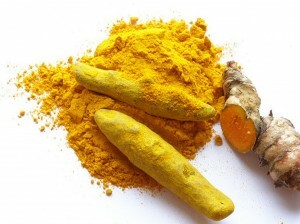 Traditional Ayurvedic has used Curcumin (the substance in Turmeric) in medicine for centuries to treat inflammation. Companies use a process to extract the Curcumin substance from the Turmeric plant (Curcuma longa). In the past few decades, the international scientific community has shown an increased interest in Curcumin, because it does appear to have an anti-inflammatory effect, and it may even help fight cancer. Experts have conducted extensive studies on the anti-inflammatory properties of Curcumin in vitro (i.e. in a petri dish containing loose cells or pieces of tissue). Meanwhile, this type of research has shown that Curcumin inhibits the production of new pro-inflammatory cytokines and prostaglandins in the inflamed cells [1, 2, 3, 4]. As a result, the inflammation is no longer ‘communicated’ to other cells, which can stop this negative process . Moreover, Curcumin blocks the formation of COX-2 and 5-LOX, two enzymes responsible for inflammation, in various ways [2, 3, 5]. It also lowers the production of MMPs (enzymes that cause cartilage degeneration) in inflamed cartilage tissue. As a result, cartilage breakdown immediately slows down [2, 3, 4, 5, 6]. A key mechanism that allows Curcumin to produce many of these effects is the lowering of the action of transcription factor NF-κB . Generally, this transcription factor is activated by stress stimuli, such as inflammation factors (e.g. TNF-α and IL-1β), extreme mechanical stress or the presence of cartilage breakdown products . 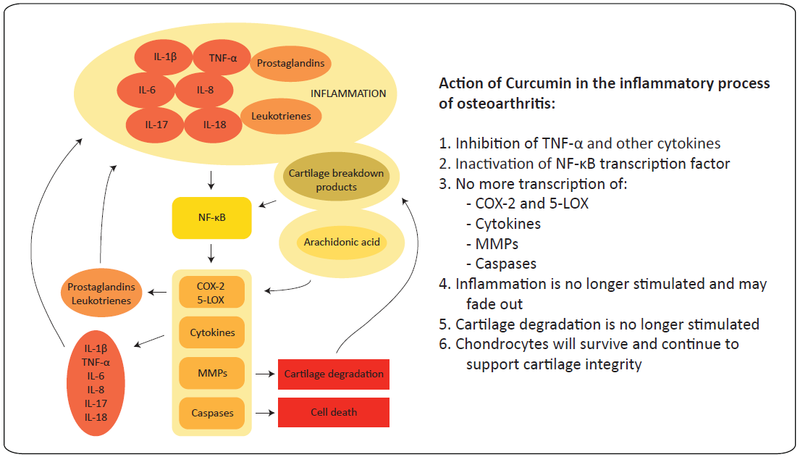 By influencing the NF-κB activity , Curcumin can inhibit the production of the inflammation factors TNF-α  and IL-1β [3, 5], as well as the breakdown of cartilage by MMPs . Moreover, Curcumin lowers the production of prostaglandins and COX-2 in the cells of inflamed joint mucous membranes , and it lowers the number of mucous-membrane cells in a controlled manner [7, 8]. 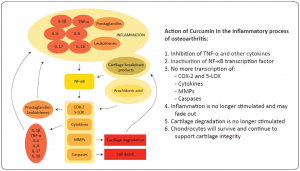 As such, Curcumin has a positive effect on the degenerative inflammation process in joint diseases, including rheumatoid arthritis and osteoarthritis. As is often the case for in vitro research, these results for Curcumin do not reflect its use in clinical practice. If someone regularly eats Turmeric (for example in yellow curry sauce, which naturally contains this substance), the question remains how much of this actually ends up fighting the inflammation. After all, Curcumin is not optimally absorbed in the gastro-intestinal tract. Should we consume higher doses to see an effect? That is an option, but even so, it would not necessarily translate into a highly effective treatment. Therefore, a number of scientists who truly believe in the power of Curcumin have devised some ways to boost its absorption. Sometimes we combine it with another substance to allow the intestinal wall to better absorb it and transport it into the blood stream. Another option is to link it with a molecule that enables a better attachment to the intestinal cell membranes. These efforts have proven successful in a recent study on Curcumin and ‘turmeric essential oils’, which boost the absorption of Curcumin in a natural manner. Patients suffering from rheumatoid arthritis reported a decrease in pain and improved function when taking this variant of Curcumin . This improvement was similar to, or even higher than that reported by the control group, which was administered diclofenac (an NSAID) in the same period . Moreover, the level of C-Reactive Protein (CRP), an inflammation protein, in the blood had decreased more in the group taking Curcumin than in the NSAID control group . A possible explanation is the different effect Curcumin and NSAIDs have, because unlike Curcumin, the latter do not inhibit the production of TNF-α . Considering Curcumin truly does act as an anti-inflammatory without side effects , unlike NSAIDs, which have many (and often serious) side effects, it is not surprising that many people are now opting for this safe, natural and equally – if not more – effective substance extracted from the Turmeric plant. Another advantage is that it is safe to use in combination with traditional medication. We recommend a liquid treatment to boost its absorption even further, as these contain a Curcumin variant with a higher bioavailability. Such liquid treatments also require a lower dose to achieve the same effect, because it is easier for the gastro-intestinal tract to absorb from a liquid than from dry powders and capsules. Antony, B.; Merina, B.; Iyer, V.S. ; Judy, N.; Lennertz, K.; Joyal, S. (2008) A pilot cross-over study to evaluate human oral bioavailability of BCM-95® CG (Biocurcumax), a novel bioenhanced preparation of curcumin. Indian Journal of Pharmaceutical Sciences 70;445-449.